RECORD-SETTING QUARTERBACK - Pearland junior quarterback J.D. 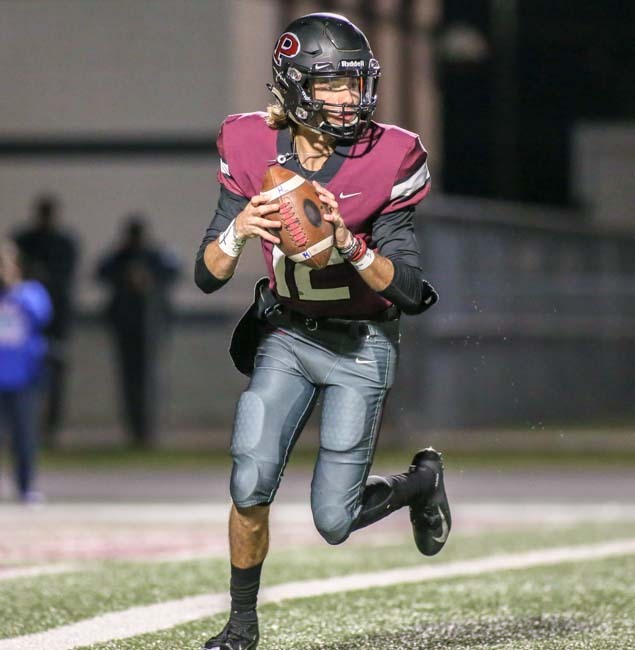 Head, who transferred from Oklahoma in the summer to Pearland, set three PHS passing records his first season in guiding the Oilers to a 10-1 season while capturing the District 23-6A championship. Head topped previous records set by former Pearland All-State signal-caller Trey Anderson who led the Oilers to a 5A Division I state title in 2010. PEARLAND — Pearland and Dickinson have hooked up in the playoffs in 2014 and 2015 in the area round and the Gators won both games 35-21 and 26-23 (4OT). This time the Gators faced the Oilers in the opening round, but the result was still the same as Dickinson dominated Pearland for a 49-21 win to end the Oilers season after posting a perfect 10-0 regular season mark. Dickinson was led by quarterback Mike Welch who was responsible for six of Dickinson's seven touchdowns, three of which were thrown to receiver Darryl Harris, who had a fantastic night both in the passing game and as the Gators' punter, often putting the Oilers in bad field position. "We've been here before, and we respect Pearland, they're a good, quality opponent" Dickinson head coach John Snelson said. "It's tough coming over here and beating them in their house, and I just thought the kids and the coaching staff did a great job of getting ready, and we played just as hard and as fast as possible." This is the eighth time in Pearland's history they have finished with a 10-0 regular season record before entering the playoffs. It is the third time that the Oilers have been eliminated in the first round (1962, 2005, 20018) after a perfect regular season. Pearland closes the first-year for head coach Ricky Tullos at 10-1.